One day you can set sail to the stunning Whitehaven Beach on Whitsunday Island and the next get your adrenalin pumping white water rafting on the mainland. There’s a range of reef tours on offer where you can get a bird’s eye view of the area on a scenic flight and then see what lies beneath the azure water either by snorkelling, scuba diving or in a semi-submarine and stay dry. Whatever you choose to do, if the weather is good, you're pretty much guaranteed some beautiful scenery, friendly tour guides and amazing natural surroundings, so get in and book your Whitsundays tour now! There’s a Whitsundays tour for everyone so take a good look at the tours below to find one that suits your needs. Glide through the pristine Whitsunday Conway National Park on a 3.5-hour guided Segway tour. 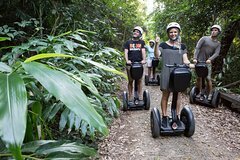 The only Segway tour in Australia to operate in a full rainforest National Park. Your tour includes full training informative commentary by your experienced tour guide, courtesy bus pickup and drop-off from your Airlie Beach hotel and a delicious and fresh morning tea. Enjoy spectacular views while you glide along the Whitsunday Bicentennial Boardwalk on a Segway. A Segway is a great way to get around, it is easier than walking, and more unique and personalised than a coach tour. You'll ride your own Segway from Airlie Beach to Cannonvale stopping on the return journey to enjoy delicious included dinner while watching the sun set over the Whitsundays. Hop aboard your own high-powered jet ski and experience the gorgeous waters of the Whitsundays at high speed on a guided tour departing from Airlie Beach. Choose from either a 1 hour or 3 hour jet ski tour, then join your guides for a trip either around Airlie Beach's picturesque shoreline or out further to the spectacular waters surrounding South Molle Island. With all safety gear and full safety briefing included, this is an excellent way to combine Whitsundays sightseeing with a dose of on-water fun, as you pilot your own Yamaha Jet Ski for some bumps, spins, and wonderful outlooks. 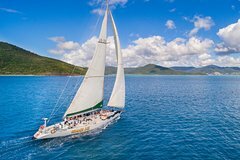 Combine the best of relaxation, island exploration, cruise sightseeing and amazing scenery with this tour to both Daydream Island and stunning Whitehaven Beach! 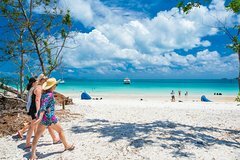 Head out from Airlie Beach for a full day worth of Whitsundays entertainment amongst all its incredible scenery, aiming first for a stop on Whitsunday Island's famously beautiful Whitehaven Beach - widely considered to be the #1 beach in Australia and one of the best in the world. This great value full day cruise will let you visit two of the most essential destinations in the Whitsunday Islands - Hamilton Island and Daydream Island - while enjoying full use of all resort facilities, as well as a delicious lunch, all for one entirely reasonable price! 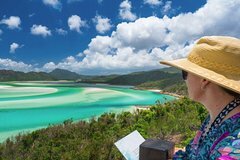 Pay a visit to one of Australia's most beautiful spots - Whitehaven Beach on Whitsunday Island - with this half day tour that features a cruise encompassing some of the most iconic sights of the Whitsundays. 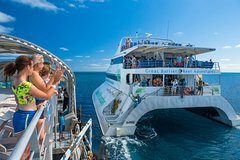 Take your choice of either a morning or afternoon itinerary with a selection of available departure points including Port of Arlie, Daydream Island, or Hamilton Island then board a comfortable, spacious sightseeing vessel for an epic trip through the vivid colours and impressive scenery of the Whitsunday Islands chain, headed for Whitsunday Island itself - the largest island in the Whitsundays. This exclusive and comprehensive Whitsundays day tour combines whale watching in wonderful surrounds with a trip to the spectacular Whitehaven Beach. Encompassing a full day's worth of spectacular marine and island exploration, this tour departs from Airlie Beach in the morning where you'll board a comfortable, smaller yet powerful vessel limited to just 12 passengers per trip to ensure the best possible viewing angles. From June to September, see the majestic Humpback Whales in the stunning surrounds of the Whitsundays with this 4 hour whale watching cruise on a luxury boat that will take you on a boutique tour to get up close with these gentle giants of the ocean. 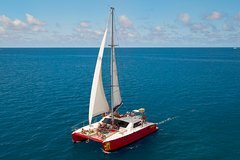 Experience Tongarra, a custom built catamaran that offers an on-board living and sailing experience that is hard to match, enabling you to see the best of the Whitsunday Islands. Tongarra is ideal for singles or groups and is geared towards the young, fun-loving, adventurous backpacker (with a sense of humour). Spend 3-days, 2-nights exploring Whitehaven Beach and Hill Inlet Lookout, with your local, professional guide. Your group is a maximum of 24 passengers per trip. Experience the Great Barrier Reef for two days and one night. By day, enjoy all the activities on offer at Reefworld, a pontoon moored on one of the most spectacular areas of the Great Barrier Reef, including snorkeling, semi-sub rides and viewing parts of the world’s largest coral-reef system in an underwater chamber. Later, spend the night at Reefsleep—on the upper deck of the pontoon—to sleep under the stars, 40 nautical miles (74 km) from shore. Fall asleep under twinkling stars in a swag (tent). Round-trip transport and most meals are included. 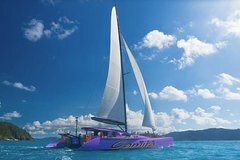 Spank Me Whitsundays 2 day/2 night adventure tour explores the World Heritage-listed Whitsunday Islands, visiting Whitehaven Beach and snorkeling the fringing Great Barrier Reef. 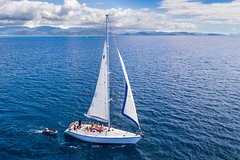 You can help the crew and pull up the main sail, otherwise relax on the spacious deck and enjoy the view of the pristine Whitsunday Islands. 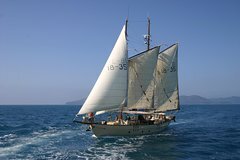 The 82-foot sailing vessel Spank Me Whitsundays caters to guests between 18 and 35 years old and the young at heart. She Sleeps 26 guests and 3 crew in open plan bunk rooms with mixtures of single and double bunks. All meals are freshly prepared on board and include roast chicken, spaghetti bolognese, wraps, continental breakfasts, fresh breads, green salad, pasta salads plus loads more, you wont go hungry! 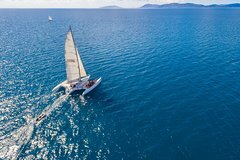 Mandrake Whitsundays takes 14 guests around the islands for 2 days and 2 nights, allowing you to snorkel the coral fringed Islands and explore the spectacular Whitehaven Beach, with such a small group of guests Mandrakes tour is one of relaxation mixed with some awesome sailing. Mandrake caters to guests of all ages. She sleeps 14 guests and 2 crew in a mixture of open plan bunks and doubles. All meals are freshly prepared on board and include home cooked roast with trimmings and gravy, spaghetti bolongnese, pies, fresh meats, salads, breads, fruits, dips and crackers Plus loads more! You wont go hungry!